"Lose the wheat; lose the weight". That is what gets pounded into your brain through reading this insightful book. Over the holiday season, I had some thinking time to both start and finish this book by William Davis. 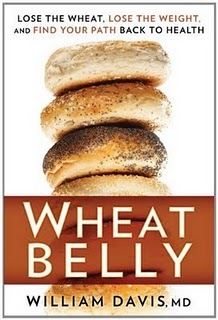 I thoroughly enjoyed reading "Wheat Belly" and I felt more enlightened after reading the information it provided on things such as diabetes, heart disease, arthritis and fat disposition. Wheat is everywhere. It is in crackers, cereal, various candy bars, breads, bagels, pastas, etc..
Another problem William suggests of various forms of wheat are high blood sugar spikes. Basically, William writes about blood sugars sky rocketing based on the high GI (glycemic index) of wheat intake. This high blood sugar spike which may happen multiple times per day leads to adipose (fat) accumulation mostly around the waist. This added fat deposition can and is leading to the most number of diabetes (type II) cases we have seen in human history. A third issue William Davis tackles is the strain our 'wheat diets' takes on our hearts. Davis himself is a cardiologist and he states that constant daily ingestion of these various forms of wheat can elevate your HR (heart rate) and put undue stress on your cardiovascular system by accumulating triglycerides (fats) within your artery walls. This is the high cholesterol, high bp and high diagnosis of heart disease which we are seeing at younger ages each year in North America. Now, this is a handful of information; I get it! That being said, is it realistic to live a Wheat free diet and still be healthy? Of course! Do I recommend it.....Not entirely. Williams is educated and he is an idealist who practices what he preaches which is fantastic and the world needs more people like him. However, I believe in balance and am a realist. I believe in exercise, sleep, solid nutrition and having fun in life. Now, full restriction of wheat does have draw backs and may save you temporarily on toilet paper but I think scaling back wheat intake is more realistic. Other adults have adopted my realist philosophy around wheat intake. I have reduced and watched my wheat intake more so than ever before. Not because I want to lose weight, but because it is making me feel better as a personal trainer and educator. I try not to eat wheat late in the day and spread my snacks out diligently for 'energy management' purposes. To me, that works! For you, I suggest finding what works. First, read "Wheat Belly". Second, be smarter at the grocery store. Third, ask other health care professionals such as your doctor, trainer, dietitian, etc and get a second opinion before going 'wheat free' or reducing wheat intake.